Last week, we saw Google working on ways to make their Android OS more accessible to the visually-impaired. While Apple has yet to come out with features that address the same challenges, third-party application developers are taking up the slack. Muhieddine El Kaissi's recently released iPhone, A Special Phone (iTunes link), which attempts to simplify the ability to dial without looking at the iPhone’s touchscreen. Instead, it relies on other functionality of the phone, such as its accelerometer. A Special Phone lets you set up a list of up to six contacts and then shake the phone a certain number of times to call that person. You shake the phone once for the first contact, twice for the second, and so on. The phone waits two seconds after the last detected shake and then automatically dials the specified contact. 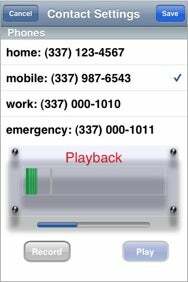 In addition, you can record yourself saying the name of the contact, which will be played back to you before the number is dialed so you can be sure that you’re calling the right person. For the visually-impaired, setting up the application will still probably require some help, since it requires using the iPhone’s touchscreen interface. A Special Phone costs $3 from the App Store and is compatible with any iPhone running iPhone 2.2 software or later.